Truth be told, I haven’t always been a scone person. Then, one glorious morning while I was coaching a team of cute little swimmers, a mom brought me one of these Mocha Chocolate Scones still warm fresh from the oven and my life was forever changed! I became a scone super fan and still am to this day. 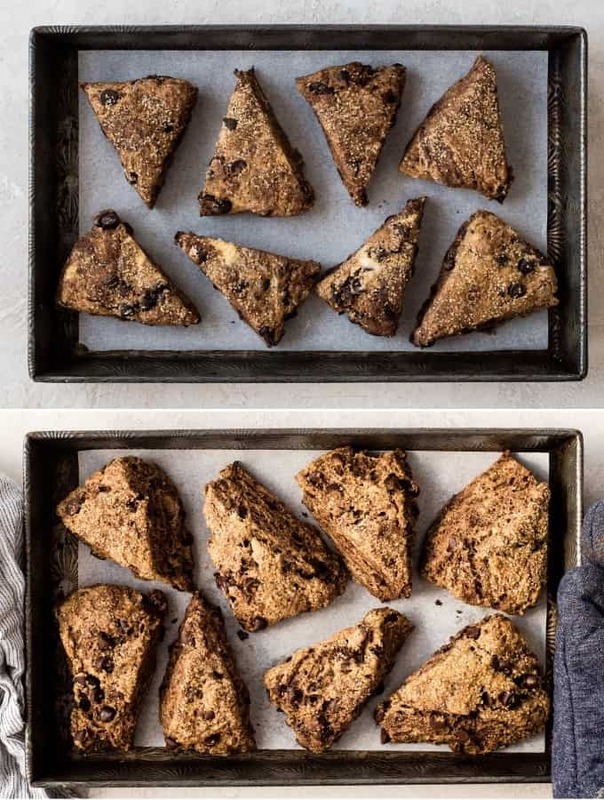 (Read the whole scone story on this Cinnamon Chip Scones recipe post)! 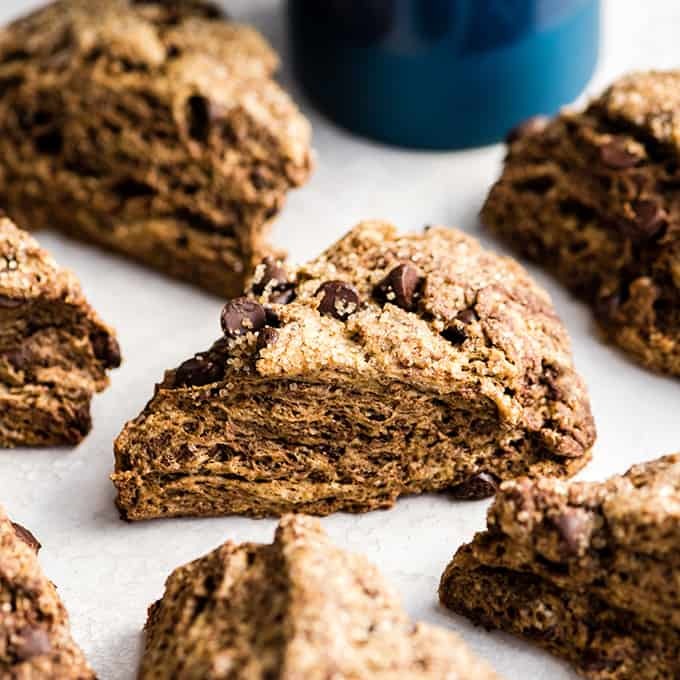 These mocha chocolate scones are life-changingly delicious and are the perfect companion to a warm cup of coffee! They are easy to make and come together in less than 30 minutes! You can even make the dough the night before and bake them in the morning! One of the many things I love about these scones is that they’re not overly sweet! The espresso powder and chocolate give them a dark, rich flavor! Which I love because I don’t like overly sweet breakfasts! This scone recipe would make a great addition to a Mother’s Day or Easter brunch! 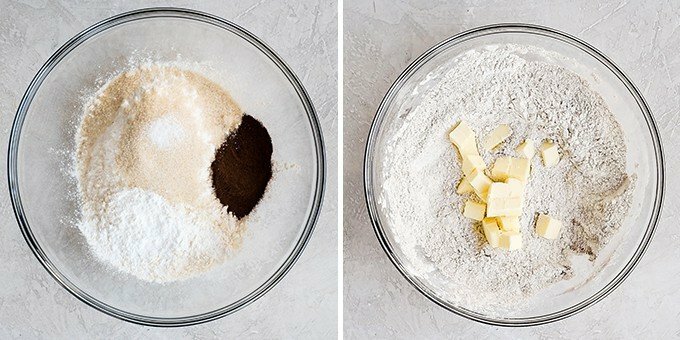 How do you make Chocolate Scones? As always, let’s jump into how to make these chocolate scones step-by-step. Of course you can watch the video to see the entire process, but it’s explained in more detail below! Step 1: Mix the dry ingredients. Start by mixing the dry ingredients together. Simply add all the dry ingredients to a large mixing bowl and stir until they’re evenly combined. It’s important that the butter is cold when added to the dry ingredients. I often cut up the butter and place it in the fridge before I gather the rest of the ingredients and finish step one. This ensures it is very cold when it’s time to be added to the dough. To cut the butter into the dry ingredients use a fork, a pastry cutter, or your hands. I opted for my hands this time around, but have used all three methods with success. Just be careful not to over-mix the ingredients (because that will cause the butter to melt)! Why should butter (and the rest of the wet ingredients) be cold when you make scones? It is important that the butter and the rest of the ingredients are cold in the chocolate scone dough because the result is little “chunks” of cold butter throughout the dough. 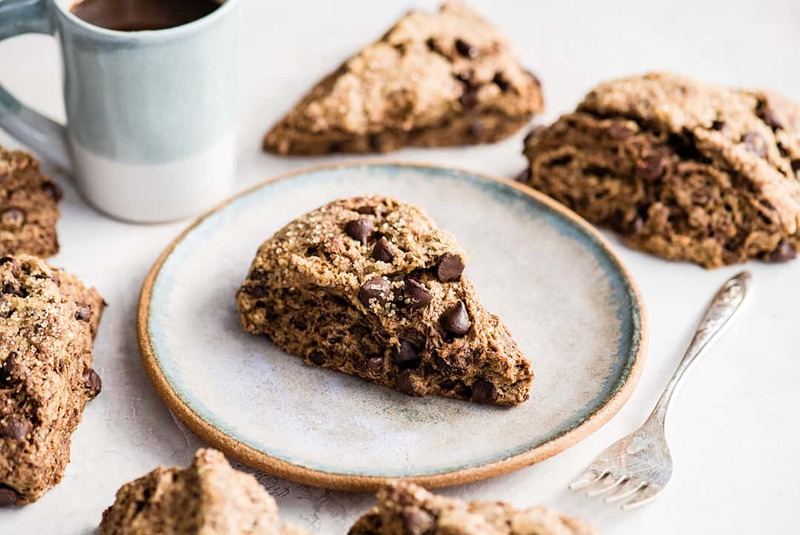 The cold butter chunks begin to melt when baking in the oven the oven, which creates flaky layers and pockets in the chocolate scones…leading to the best scone recipe ever! Next, add the rest of the wet ingredients to the chocolate scone dough. Be sure that the milk and eggs are cold so the butter doesn’t melt when they are added. Use a spatula to mix the dough until the mixture is homogenous (uniform throughout). At this point the dough will look a little crumbly and that is normal. To know if it’s the correct consistency, try to pinch a chunk with your fingers. If you can pinch the dough together easily, it’s good to go . If it doesn’t hold together and remains powdery, add more half and half 1 tsp at a time until the correct consistency is achieved. 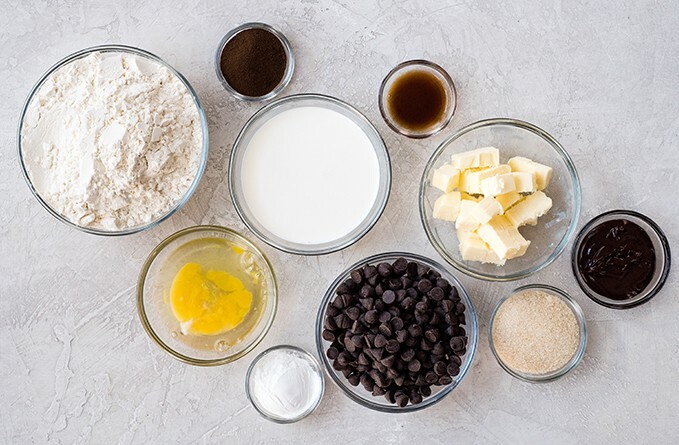 Once the dough is uniform throughout and the correct consistency has been achieved (see below) , add the chocolate chips and mix until they are evenly distributed. Turn dough out onto a clean surface or pastry slab. 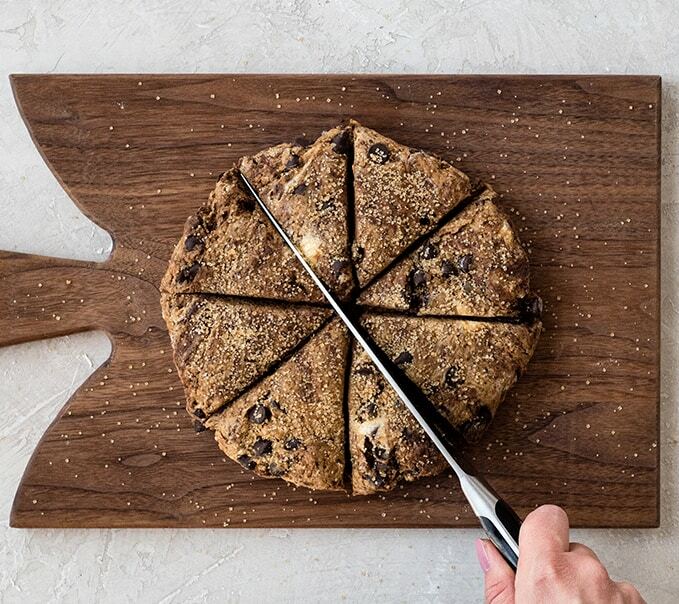 Use your hands to shape the dough into a 10″ circle. It should hold together very well as it’s shaped, and be a solid circle when you’re finished. Try to minimize cracks in the chocolate scone dough, because any cracks present at this stage will remain through baking! Check out that circle of dough, complete with beautiful chunks of butter throughout. YUM. Notice the marbled buttery texture! Those beautiful buttery pockets are imperative to making the best scones recipe ever! Transfer the dough circle to a baking sheet lined with parchment paper. Sprinkle the scone dough circle with raw sugar. I recommend patting it down slightly so that the sugar sticks to the dough! Step 8: Cut and spread apart. After you’ve sprinkled the dough with sugar, cut the chocolate scones into eight equal pieces. Start by cutting the circle in half from top to bottom. Next, cut it in half from side to side. Then cut the remaining two pieces in half diagonally and separate & spread the scones out evenly on the baking sheet. This best scone recipe will not rise or spread very much, but it’s still important that there is plenty of space between the scones to ensure even baking. 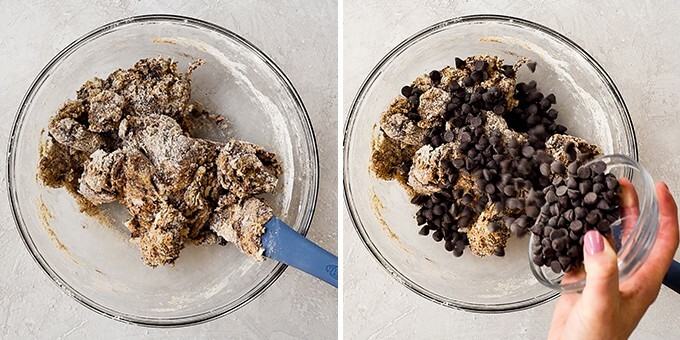 Bake the mocha chocolate scones for 16-20 minutes or until they look set. You will notice that the tops don’t really brown but the bottoms do! Transfer them to a wire cooling rack to cool slightly, then serve warm! 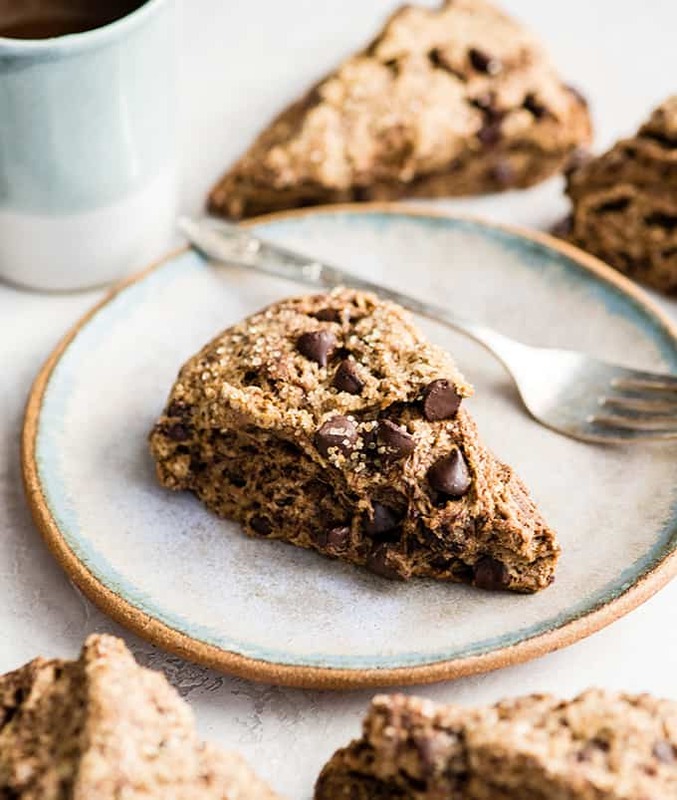 I highly recommend serving these chocolate scones warm with a cup of coffee (or mocha latte)! They are irresistible fresh from the oven! Serve with a dollop of cinnamon butter, nut butter or add a drizzle of glaze for an extra special touch! FAQs about making the BEST scones recipe! Can scones be made ahead of time? Yes! You can make the dough the night before and bake in the morning! 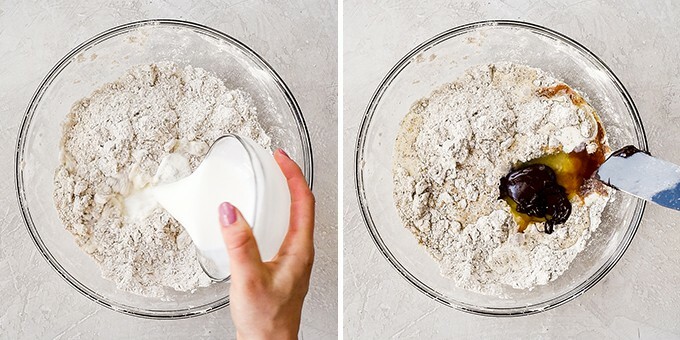 Simply make the scone dough according to the instructions, but do not cut it (leave it as a round 10″ circle). Then wrap it tightly with plastic wrap and put it in an airtight container. 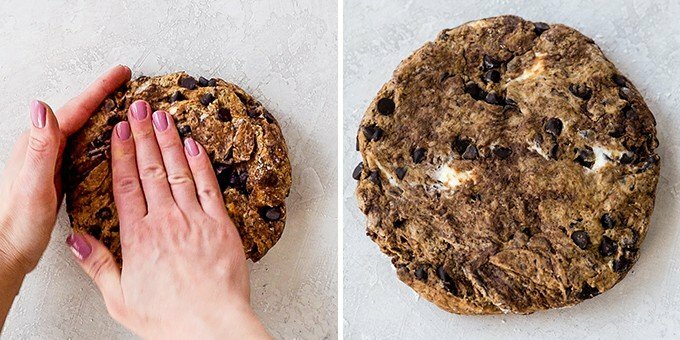 Simply cut and bake the chocolate scones in the morning! This is a great way to save time in the mornings when you’re groggy before you’ve had your coffee! Are scones supposed to be dry? Yes and no! Scones are supposed to have layers and a biscuit-like texture, but they are not supposed to taste chalky or dry. They are made for dipping in coffee/tea or spreading with a moist topping like butter or jam. So they will not be moist like a muffin. However, over-baking and over-mixing could cause them to be too dry to enjoy…if that makes sense! How do you store homemade scones? Store this scones recipe in an airtight container wrapped in plastic wrap (to retain moisture) at room temperature. Yes! Simply wrap them tightly in plastic wrap and put them in an airtight container or freezer-safe bag. Stored at room temperature, scones last 1-2 days without drying out. They can be frozen for up to two months. How do you reheat & freshen up scones? In the microwave. Simply warm scones in the microwave for 15-30 seconds (depending on the power of your microwave and the number of scones you are heating up). Then enjoy! In the oven. Wrap scones in foil (to prevent drying out) and warm in the oven preheated to 300 degrees F for 10-15 minutes! 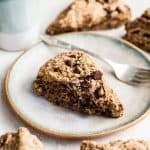 While there are a few possible substitutions in this recipe, these chocolate scones are the best when the recipe is followed exactly as written, and I do not recommend making changes! All-purpose flour. I honestly have not tried making these scones with any other flour besides unbleached all-purpose flour. If you try using an all-purpose gluten-free flour or another flour substitute, please report back and let me know how it goes. Granulated sugar. I always bake with organic cane sugar, but any granulated sugar works well. Espresso Powder. For the richest mocha flavor use espresso powder! If you don’t have access to espresso powder, instant coffee works well too (I have used both options with great success)! Butter. Again, I have not tried making these cinnamon scones with anything other than butter. Both salted and unsalted butter works well! I usually use salted, so if you opt for unsalted you may need to increase the amount of salt in the recipe by 1/4 tsp. Half and Half. This is the only ingredient I have played around with. I have used whole milk and they turn out fabulous. I have also tried using heavy whipping cream, but I needed to add an extra 1 TBS of cream to get the dough to stick together (they still tasted perfect). Chocolate Chips. 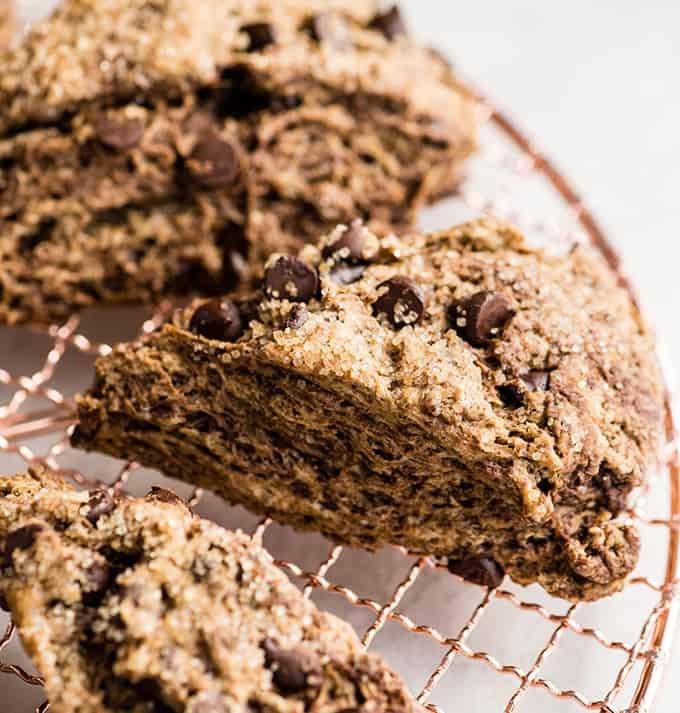 Chocolate chips or chunks or chopped chocolate bars can be used in this sweet scones recipe with great success! Choose your favorite variety and have at it! Raw Turbinado sugar. I use organic raw turbinado sugar to sprinkle on top of the scones, I find it works the best! Do you need eggs in scones? In this recipe the answer is yes! Using egg in this scone recipe makes them have a richer taste and an amazing texture. It also adds to the rise of the scone. In a large bowl add flour, sugar, baking powder espresso powder and sea salt. Stir to combine. Add butter and using a fork, pastry cutter or your hands, cut the butter into the dry ingredients until there are coarse crumbs. (You want little chunks of butter)! Add half and half, melted chocolate, egg and vanilla extract and stir until combined. The dough will look crumbly, but should clump together when squeezed between your fingers. Add mini chocolate chips and stir until evenly distributed. Turn dough out onto a well-floured surface (or pastry slab) and form into a round circle about 10” in diameter. Transfer the circle of scone dough to the prepared baking sheet. Sprinkle the top with raw sugar and gently press it into the top of the scones. Carefully separate the scones and spread them out evenly on the baking sheet. Bake in the preheated oven for 16-20 minutes, or until the scones look set. Remove from the oven and transfer scones to a baking sheet to cool, or serve warm (which I highly recommend). Hi Laura. You left out the cinnamon in the recipe ingredients. How much do you use? That is supposed to be espresso powder not cinnamon! I fixed it! Okay I’ve recently really been craving scones so this is PERFECT! Sounds amazing, Laura! Hey Laura. I am definitely going to make these – they look so yummy. I have a question about making the dough the day before. Do you refrigerate it or leave it on the counter? If you refrigerate, do you have to let it get room temp before popping them in the oven? Just asking because of the precious, precious butter situation.